Is battery leak damage covered under warranty? No. Battery exhaustion, battery leakage and flashlight damage are all specifically excluded from our warranty. Flashlight will not turn on, what can I do? 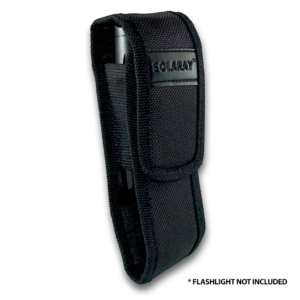 If your flashlight came with an AAA Battery Holder (see BATTERY HOLDER instructions), test with new batteries. If flashlight turns on, make sure lithium-ion batteries are fully charged (see CHARGER OPERATION). If they are exhausted, weak, or damaged, replace them with new Solaray premium 18650 lithium-ion batteries. Flashlight still will not turn on or will not stay on, what now? If replacing the batteries does not solve the problem, check the tailcap. The metal surfaces contacting the barrel, tailcap and battery terminals should be shiny metal without obstruction between them. Any corrosion or dirt should be carefully removed. The dual channel cordless battery charger is not working, what wrong? Be sure to insert battery/batteries into the charger slots. One or two batteries may be charged at a time. The battery positive (+) end should be facing towards the LED indicator. Plug the charger into a wall outlet. Incorrectly inserting the batteries will prevent the batteries from being charged and the LED indicator will not illuminate. A red power indicator will illuminate which indicates charging. The green power indicator should illuminate once the batteries are fully charged (typically 6-8 hours for a 3000mAh capacity battery). Never leave charging batteries unattended – you should ALWAYS be near the batteries while charging. DO NOT EXPOSE BATTERIES TO EXCESSIVE HEAT AS THEY CAN EXPLODE. Sometimes the green indicator light will not come on when the batteries are charged, why is that? This typically happens when there is not good contact between the battery and the charging contact point. You may need to spin the batteries while they are on the charger and the lights will stabilize. If the green indication light does not come on after 10 hours of charging the batteries, then it is possible the charger is damaged. This may have happened during product shipping or the item was dropped. Submit a Support Ticket so we can help you resolve the issue and/or replace the item.